It was the early Greek philosophers that taught us the importance of wonder; a lesson to be remembered in a world where the constant invitation is to control and possess. Occupied by our penchant for usefulness our capacity to wonder is diminished. And yet the ordinariness of life is rich with a splendor commonly missed. I am thinking now about colour and how different our world would be without it. Kimberly Garzabrings forth that blaze of colour also holds the resources for the artist’s palette. Mercury, sulfur, potassium, iron, copper, lapis lazuli and a host of other earthly resources yields the diversity of colours for art making. Beyond the science and theory of colour we may ask of the meanings of colour. In our consumerist society the process of branding takes seriously the importance of colour. Whether you think of your favourite coffee shop, computer brand, soft-drink or the postal service colour comes into play. Colour has also had a significant role in religious symbolism. One rendering suggests that red stands for blood and sacrifice, yellow for divine presence, green for life and renewal, violet for suffering, gray for mourning and repentance, black for death and white for purity and virtue. Colour engages us and moves us. It is a gateway to help us to see, discern and discover. Some years ago when I was teaching I painted my office a chocolate brown, it was a novelty of sorts in a building that was primarily institutional beige. The room was lit with a single desk lamp and the florescent lights were never on. Over the years I heard from students that they found the room warm and inviting and an easy setting for conversation. I have no doubt that the surrounding colour was what elicited this response. When one thinks of the arts it is the visual counter the most colour. Over the past eight years the mailed out newsletter has always used only one colour and images have been in gray scale. This issue is the first issue printed in full colour and we will be back to single colour in December. So we have taken the opportunity to show work of six visual artists. Cottage Country is a collage of colour suggesting flora and water. 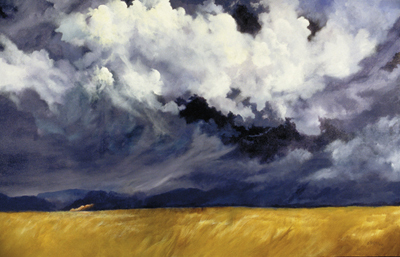 Passing Storm is an evocative piece with its play of light and shadow depicting a turbulent sky over a restful golden field of grain. The artist is able to capture movement through the use of colour. Blue and Gold with Pearls seems to do the opposite with its sense of stillness. This is an unusual work bringing together abstract and representational painting each employing rich colour and texture. Red Day with Blue Leaves gives a sense of transition, nature on the move but resplendent in colour and delicate in line. The faces are etched with the burdens of life and the passage of time, each with a gaze of hopefulness.Colour again masterfully used to draw us in, if only for a moment, to the life and experience of the one we see. Colour is capable of creating an atmosphere, generating emotion, evoking memories and speaking to us in surprising ways. Within the gift of light are seemingly infinite possibilities a few of which we get to enjoy each day. In the rich diversity of colour we have a poetry of sorts that speaks to us of the beauty of the world we inhabit. Colour is well worth celebrating.